Our spatial light modulators (SLMs) are high-resolution liquid crystal panels with micron-sized individually addressable pixels, which can be used to shape the wavefront of an optical beam. Grey-level values on the panel are converted into phase shifts. 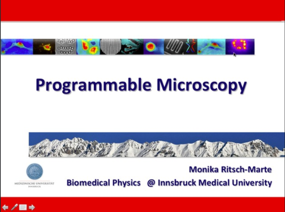 Some recent achievements are the demonstration of spiral phase contrast, giving rise to strong isotropic edge-enhancement in the images, SLM-based depth-of-field multiplexing or quantitative single-shot-DIC imaging and more (see Topics below).